Need something to keep a medium to large crowd occupied, but don’t want to spend a lot of money and don’t want to be so entertaining that they stay too long? This is it. It seems I’m stuck on tomatoes this year. From pasta sauce to salsa, everything is looking red. Even though a pretty good homemade tomato based salsa is easy to make, there’s a persistent allure of laziness asking, why can’t someone sell an equally good inexpensive salsa? So in a classic Diogenes-like search, here’s the first step in the quest for a good purchasable tomato based salsa. It very well could also be the last step, or at least the last step you’ll want to read about. 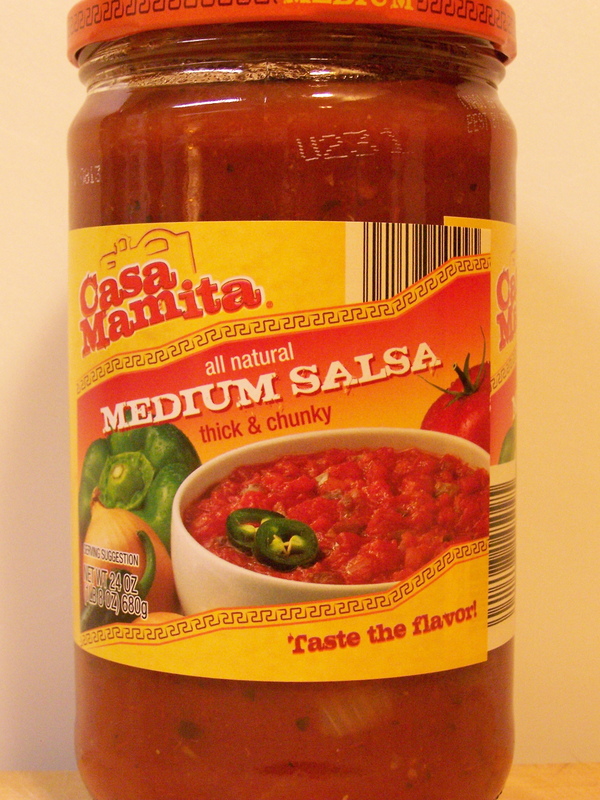 The attraction to ALDI’s Casa Mamita Medium Salsa is twofold, price and quantity. 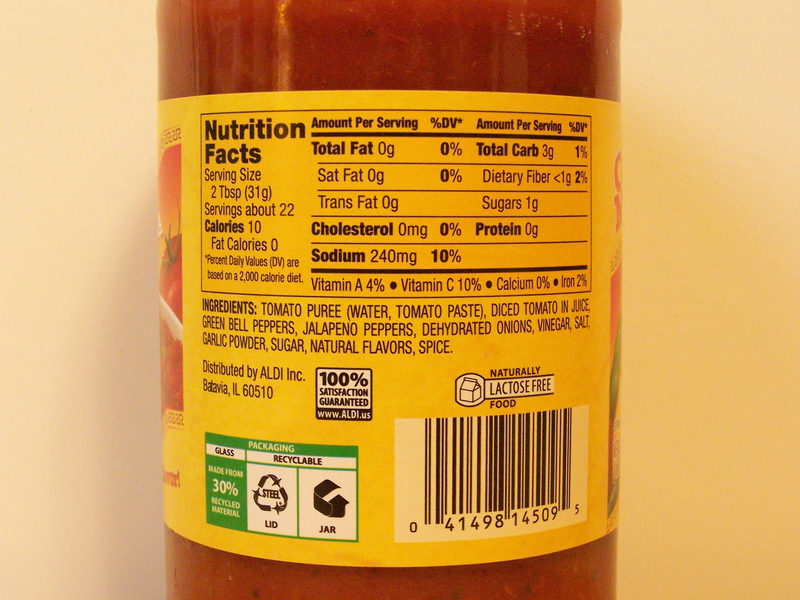 The price is about 70% of the sale price of a branded salsa, but the jar is bigger (about 9 ounces bigger). That’s more for less. It’s hard to pass up that kind of deal, especially when you need large quantities for group gatherings. The only drawback (and maybe it’s not) is it’s pretty bland. Even a little blander than its branded competitors. So if you’re looking for something with a little pop, this will disappoint. However if you just need something to dip some tortilla chips in to keep people’s hands and mouth’s occupied, this will fill the bill. However, what’s really interesting about this is the amount of tomato flavor in the jar. It’s just full of tomato flavor. So much so, that it has more tomato flavor than most jarred pasta sauces. There in lies the serendipity in this review. Read the accompanying questionable recipe, Pasta Ranchero. This entry was posted on 12/15/2011 at 10:05 and is filed under ALDI, Recipes, food, cooking and related items. You can follow any responses to this entry through the RSS 2.0 feed. You can leave a response, or trackback from your own site. I’m just a customer like you. You might also tell your store crew. When is wichita going to get more casa mamita salsa . Joe, the best thing to do is ask the store crew. They’ll most likely know. This is the first time I’ve had this salsa and I think it is awesome! Just enough hot to the medium salsa to make it worthwhile….. and their view is correct, it is very tomatoey but it is delicious! I don’t think it is as Bland as in the review…… in fact, I think it is pretty tasty! Just tried this, the corn salsa. AIIEEEE CHIhuahua! GREAT FLAVOR & HEAT TO BOOT! I’m already stirring the pot on a new creation! This is not for the faint at heart! I hope the new recipe goes well. 😋. Thanks for adding your comment. Generally, I like the Casa Mamita salsa from Aldi. You have to shake it well before use, and that is stated on the jar. My only issue with it is that it is a bit too salty. I wish, and I hope they’d reduce the amount of salt they use. Is there a way to buy the Kale/beet salsa online as it is a temp product in stores? Like the product but where is it made? That’s always an interesting question. Unless it says ‘Product of . . . ‘, it’s probably made in the US. Tried the Casa Mamita salsa and you are right about the tomato flavor but bland? No way. Has a much more complex flavor than other medium salsas such as Tostitos. Very good value for the price. All this said knowing everyone has a different take on all foods. Hard to beat homemade but the price is right for something great. Glad you like it. I guess I’m spoiled by our local Mexican restaurant which usually has great salsa, although tonight it’s a little on the tame side. Generally, I’d put most national and store brands in the same category as Casa Mamita. We purchased a box of Casa Mamita Taco shells from Aldi’s….there were live ants inside the wrapper and inside the box!! Don’t buy! !